1 January has been full of Miss Universe events, so when Tim Yap threw a costume party for his birthday celebration, we knew we'd be seeing some beauty pageant-themed outfits. 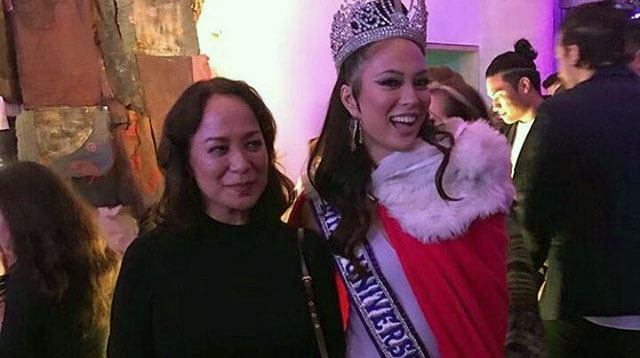 We think the crown for Best Costume has to go to Isabelle Daza though—she dressed up as her mom Gloria Diaz, who won Miss Universe 1969! Congratulations to Tim Yap and his partner Javi Martinez for ending the night with an engagement! 2 It seems that Nadine Lustre and Lauren Reid are enjoying their beach trip! The girls have been posting a lot of photos on Instagram lately, and James Reid makes a hilarious appearance in some of them. Lauren and Nadine even posed for a cheeky photo—a great reminder for us all to hit the gym and do some squats! 3 Just this week Pia Wurtzbach charmed the universe when she declared that "Marlon is mine" on Fast Talk with Boy Abunda. In an interview with ABS-CBN News, Marlon said that he "didn't expect it. But yeah, sobrang kilig...for her to say that." Marlon added, "Pia Wurtzbach is... also mine." How sweet are these two?! 4 Liz Uy has joined the likes of models Kendall Jenner and Adriana Lima—she’s the first Filipino influencer to be represented by The Society Management! Liz is now part of the Creatives, alongside blogger Chriselle Lim of thechrisellefactor. 5 Do you love movie Easter eggs? A compilation video was shared on Toy Story's Facebook page, and the footage goes all the way back to 1995′s Toy Story! Films including Cars, Monsters, Inc., Finding Nemo, Ratatouille, Inside Out, Brave and Finding Dory were featured too. The Toy Story Pizza Planet truck shows up in nearly every single movie!